25th Annual KIN Alternative Holiday Giving Fair! The winter holidays are just around the corner. Avoid the stress of giving the perfect gift to your friends and family with a gift that is truly meaningful. At the KIN Alternative Giving Fair you can make a donation in the name of your recipient to wonderful local, national, and international nonprofit organizations. You make a donation that can purchase a new window for a house being built by Habitat for Humanity, or that can pay for the training of a Hero Rat for landmine removal, or a night in a shelter for a homeless family. You will receive a lovely card to give to your recipient explaining the donation that was made in their honor. No malls, no lines, no wrapping, and no wondering if it is the right size and color. Best of all it is a gift you give twice as it will bless someone in our community, nation, or world that is in need as well as your loved one. Join us at the Peter Kirk Community Center on Saturday November 3rd between 9AM and 4PM. The address is 352 Kirkland Ave in downtown Kirkland. 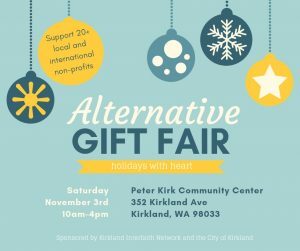 Let this holiday season be filled with joy, surprise, and meaning with a gift from the KIN Alternative Holiday Giving Fair. See you there! Walk with FIRE in Kirkland’s 4th of July parade! For more information on the parade including the route, visit http://celebratekirklandorg /parade.htm. For further information, email info@fire-wa.org . Posted in Donation Opportunities, Service Opportunities	| Comments Off on Can You Help New Residents Move Into Athene? Posted in Assistance	| Comments Off on Do You Need Help Paying Your Electric Bill?